Tim Fischer on an earlier visit to the Svalbard seed vault above the Arctic Circle in Norway. FORMER Deputy Prime Minister of Australia and fervent farming industry advocate, Tim Fischer, is to step down as chair of the international crop conservation organisation, the Crop Trust. 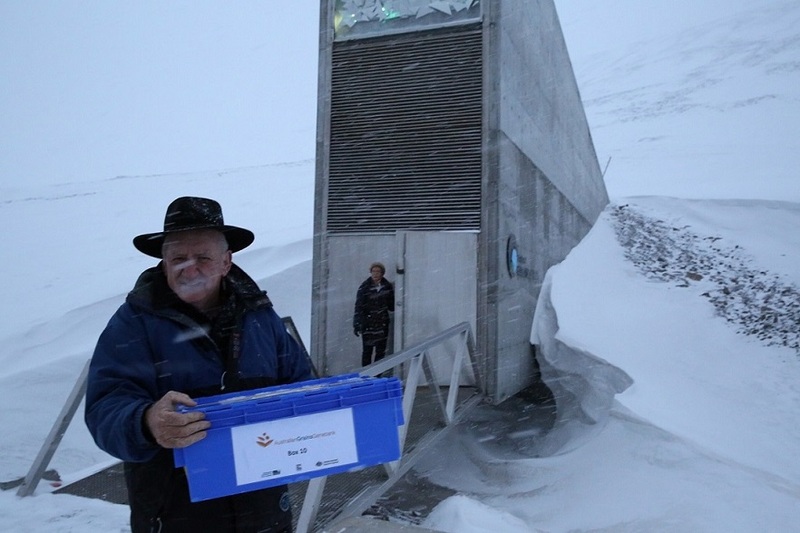 Among its many activities, the Crop Trust supports the preservation of crop seeds for future generations at international genebanks, national genebanks and the world’s backup facility, the Svalbard Global Seed Vault in Norway. 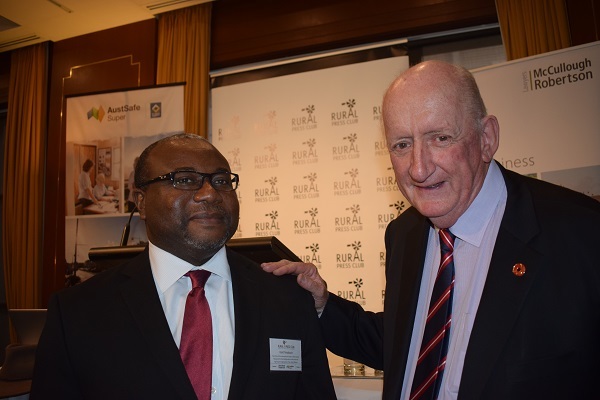 Tim Fischer (right) with the International Treaty on Plant Genetic Resources for Food and Agriculture with the United Nations Food and Agriculture Organisation’s Kent Nnadozie, Rome, at a Rural Press Club lunch in Brisbane last year. Mr Fischer joined the Crop Trust in 2013, serving as vice chair of the Executive Board until 2017, before becoming Board chair. He was elected for a second term in 2018 but will step down both as chair and Board member on 1st April 2019, for health reasons. Speaking from his farm in Victoria, Mr Fischer said working with the Crop Trust had been one of the highlights of his career. “So, it is with some reluctance that, on the advice of my very able doctors, I will step down as the organisation’s Executive Board chair. As part of my treatment it is recommended that I refrain from international travel for the time being, and step back from various positions I hold,” he said. Mr Fischer said the Crop Trust had made huge strides in recent years, under the efforts of his predecessor as Board chair, Walter Fust, the Executive Board and all who worked at the headquarters. “I am confident the organisation will achieve much in 2019 and beyond. I strongly welcome the election of Sir Peter Crane as Board chair, as it means the organisation will be in very good hands,” he said. “The world is at a critical juncture when it comes to crop conservation and the plight of biodiversity, and the Crop Trust is needed more than ever before. As farmers worldwide wrestle with increasingly unpredictable weather and climate change, and as nations seek sustainable food security, crop diversity is paramount, and this is the Crop Trust’s core dynamic,” he added. Mr Fischer has been a long supporter of the work of the Crop Trust and humanitarian causes. He began his political career in 1971, after returning from deployment in Vietnam where he was as an officer in the Australian Army. He was a New South Wales Parliamentarian (1971–1984) and later an Australian Parliamentarian (1984–2001). Throughout the 1990s, he was the head of the National Party of Australia. During this time, he also served as Minister for Trade and Deputy Prime Minister in the Howard Government, holding both positions from 1996 to 1999. He then served as chairman of the Crawford Fund (2001–2006), supporting international agricultural research. He is also a consultant, author, broadcaster, former Ambassador in Rome and Envoy to the Himalayan Nation of Bhutan, Eritrea and South Sudan. Mr Fischer will be succeeded as chair of the Crop Trust by the former vice-chair, Sir Peter Crane, who is president of the Oak Spring Garden Foundation in the United States. Sir Peter, who served on the Crop Trust Executive Board from 2007-2012 before returning in 2014, was formerly the Dean of the School of Forestry and Environmental Studies at Yale University. Earlier in his career he was director of the Royal Botanic Gardens, Kew, in London, and also served as director of the Field Museum in Chicago. He is best known for his work on the origin and early evolution of flowering plants based on studies of the plant fossil record, but has been actively involved in issues of plant conservation for more than thirty years.